I want to be an example to the children of Ikageng. You can do anything; just put your circumstances behind you and grab all your opportunities with both hands. This is the words of the petite, shining eye Evelyn Khoboka, final year student in Information Technology at the Potchefstroom Campus of the North-West University. Evelyn was part of the South African team that, beyond expectation, scored first place overall during an international supercomputing conference. Evelyn was the only NWU student, as well as the only girl in die SA team that took part in the Student Cluster Challenge during the conference in Leipzig, Germany. It was South Africa’s first entry to the challenge and according to Evelyn, nobody expected them to walk away with the honours. Her story begins with a letter she received to enter the competition, after which she attended a winter school on high performance computing in Bloemfontein in July last year. There they had to learn how to build a super computer. She and a fellow student, Cassey Keating, were selected to take part in the national competition in Durban in December last year. She and her team won in Durban, and in January this year she left for Austin, Texas in the USA as part of a sponsored tour. 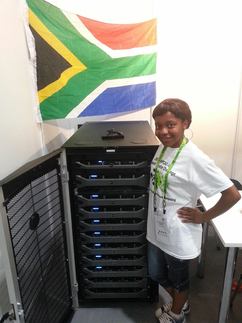 Her team consisted of four students from Wits and a student from Ikeys. She says there they were exposed to super computers, and the team was assisted in selecting equipment to build a super computer that did not use too much electricity. Evelyn says they had a huge handicap because their equipment was in Germany and they did not have the opportunity to practise. They left for Germany in June and they could only get their equipment the Saturday prior to the start of the competition on Monday. Eight teams from, amongst others, the USA, Germany and China (home of the fastest super computers in the world) took part in the competition during the conference. She says they had to perform various tests on the super computers during the competition and they focused on doing everything. The evening of the prize-giving they really did not expect to win. “Everyone thought China would win it again like they did the previous years”. Evelyn grew up in Ikageng and said she really felt like “the local girl who made it internationally”. Evelyn is currently busy mentoring two NWU teams to take part in this year’s national competition. She says she is definitely going to continue her studies next year to do her honours in IT. She has not yet decided whether she is going to follow a career in programming or supercomputing.